The old traditional ways of managing not longer work and will never work again. → inspired people have become your firm's most precious and productive resource. 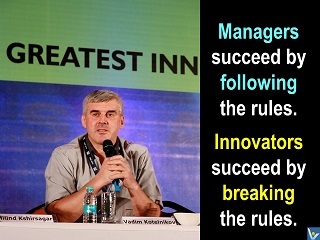 The old management practice has been erected on the assumption of human limitations as a basis for organizing. This assumption of human limitations "is so pervasive that it can be found in almost every aspect of conventional managing, from the way we over-bureaucratize our organizations and control the workforce to the way we develop and impose strategies on others without their participation or consideration of their potential contribution," says William F. Joyce, the author of MegaChange. Old hierarchical command-and-control management model focuses on managing assets and numbers. 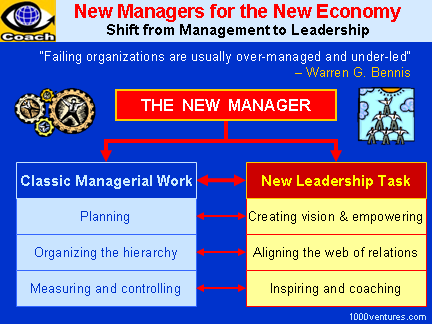 In the new era of rapid changes and knowledge-based enterprises, managerial work becomes increasingly a leadership task. Leadership is the primary force behind successful change. Leaders empower employees to act on the vision. They execute through inspiration and develop implementation capacity networks through a complex web of aligned relationships. "Good management cannot compensate for a lack of vitality." Adaptive Organization: reinvents the principles of management in response to new economic realities. Responsibility and authority are reinvented and made consistent. Responsibility is replaced by ownership. Neuro-Linguistic Programming (NLP) is the psychology of excellence and the technology of → achievement and → success.